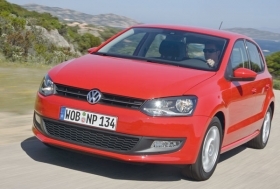 High demand for car such as the Polo helps protect VW's sales from dropping as sharply as its rivals. Volkswagen AG reduced its unit-sales gap with No. 1 Toyota Motor Corp. by more than 1 million units in the first half. During the first six months Toyota sold 463,805 more cars than third-ranked VW. In the first half of 2008, Toyota outsold VW by 1.55 million cars. VW will soon add Porsche as a 10th brand to its portfolio of marques, which includes Audi, Skoda, Seat and Bentley as well as the core VW brand. Last year, Porsche sold about 87,000 cars. Toyota, GM and VW sold fewer cars in the half than they did in the first six months of 2008. The difference was that Toyota's and GM's declines were much worse than VW's. Toyota's sales fell 26 percent in the first six months, and GM's volume declined by 21.8 percent. The nine-brand VW group's sales dropped by 5.1 percent. The top 10 ranking includes five Asian, three European and two U.S. carmakers. If Renault-Nissan's sales were counted together, the alliance would rank No. 4 with sales of 2,652,965. Renault SA owns 44 percent of Nissan Motor Co.
GM's first-half sales figure includes brands such as Saab, Hummer and Pontiac that the automaker is either in the process of selling or winding down.